The Student Senate work on initiatives to improve campus. With only one returning member from the 2013-14 academic year, this year’s Student Senate members bring many new perspectives to the table. Led by President David Zehr, a junior, the Student Senate has been working to implement both long and short-term changes based on suggestions from the larger student body. Along with the Senate’s annual undertaking of student club funding, promoting and running student elections, hosting club day and preparing for the Board of Directors meeting, they have also been working on a gender initiative, which includes the discussion of the potential inclusion of a gender-neutral dorm floor on campus, as well as the creation of a student-led immediate response team to help victims of sexual assault within the Goshen College community. Longenecker mentioned that while the co-ed dorm floor change is still in discussion, the Student Senate has been setting up a broader plan for improving the health of gender relationships on campus. In the recently released Senate update, one of the stated priorities is to “overcome misunderstanding and disrespect among men, women, and trans* people on campus.” Here, the term “trans*” is being used as an umbrella term for transgender, transsexual, genderqueer and other minority gender identities. Through this initiative, the Student Senate plans to improve the campus culture by promoting positive interactions between people of all genders. The Senate will continue to work towards this goal through their collaboration with relevant clubs and groups on campus. While the Senate is currently working on several initiatives, Longenecker considers the gender initiative to be the one she is most excited about. As another part of the gender initiative, Senate plans to host a convocation with the Sexual Misconduct Response Team (SMRT) at the beginning of the spring semester. This convocation will give students a chance to hear from the members of SMRT about how to take advantage of this resource and how their process works. Some other initiatives in the works for Student Senate include the rearrangement of the apartment bulletin boards, the installation of an ice machine within the connector and having a student-human resources contact person on campus. Starting next semester, Senate members Alma Rosa, a sophomore, and Hannah Yoder, a first-year, will be organizing and posting a weekly highlight of Student Senate activity in The Record to establish clearer communication between Student Senate and the student body. This coming spring, there will be two changes in Student Senate positions. Ben Shelly, a junior, will replace Brian Sutter, a junior, as vice president. Laura Miller, a sophomore, will replace Cecilia Lapp Stoltzfus, a sophomore, as treasurer. All students are welcome to attend Student Senate meetings. Each meeting has set-aside time for open floor, so students with ideas for future initiatives or issues that they find important are welcome to come and present them during that time. 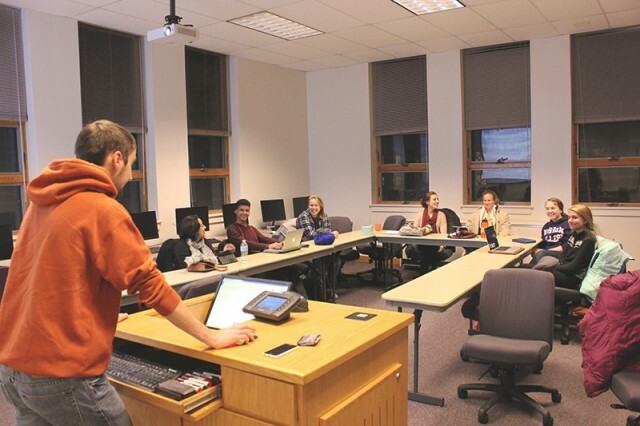 The next Student Senate meeting will be taking place in January when classes resume from the winter break.